Today in Masonic History Elizabeth Aldworth, Lady Mason, passes away in 1773. 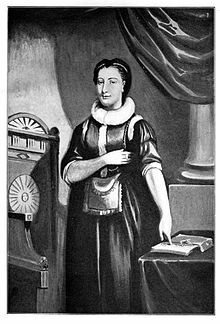 Elizabeth Aldworth was Irish and the first woman recorded as having received the degrees of masonry. Not much is known about the specific dates of Aldworth's birth or death. A plaque that was placed near her burial location indicates that she was born in 1695 and passed away in 1775. However the book Memoir of a Lady Freemason has her year of birth as 1693 and her passing as May 11th, 1773. Aldworth was the daughter of Arthur St. Leger, 1st Viscount Doneraile and 1st Baron Kilmayden of Doneraile Court, County Cork, Ireleand. By most accounts it was prior to her marriage to Richard Aldworth in 1713 that she became a mason. The story of Aldworth receiving the degrees of masonry is an interesting one. There is some discrepancy though of when the incident actually occurred. According to the book Memoir of a Lady Freemason, the date of her initiating was in 1710 and 1712 prior to her marriage. Edward Conder in his paper Ars Quatuor Coronatorum written in 1895 places her initiation between the years of 1710 and 1718. In a reply to Conder's paper William James Hughan wrote that the imitation took place after 1730. Although he referred to Aldworth as St. Leger, which would imply that it was before her marriage in 1713. The lodge that Aldworth was initiated into is sometimes listed as Lodge No. 44 in Doneraile, Cork, Ireland. Although Conder claimed in his paper that the lodge was unknown. It is also claimed that Aldworth never attended lodge. In Memoir it was claimed that Arundel Hill was present at her initiation and often sat in lodge with her. Regardless of the timing of the event and who was present the story of how Aldworth was initiated remains, generally, the same. The story claims that Aldworth (then St. Leger) had fallen asleep while reading in the family library. It was winter and the light was dim when she fell asleep. When she awoke, she could hear voices coming from the next room. So rose to investigate and due to construction that was happening in the library at the time there was a loose brick in the wall which she removed to peer into the next room. When Aldworth realized the solemnity of the ceremonies going on in the next room she decided to make her escape. As she was making her escape she was caught by the lodge's Tyler, the outer guard stationed for open masonic lodges. When she realized she had been caught, she screamed and fainted. The Tyler, who was also the family butler, summoned the brothers from the other room, including Aldworth's father. In some accounts serious debate occurred as to what to do with this rather uncommon occurrence. Eventually it was decided that Aldworth would be initiated into the lodge, thus binding her to the fraternity so that she could not reveal it's secrets. The International Mixed Order of Freemasonry Le Droit Humain, a global Masonic order which admits both men and women, named their first lodge after Aldworth.